Sun., Aug. 12, 2018, 10:54 a.m.
POMEROY — A small group of employees at Columbia Pulp in Pomeroy recently huddled around the base of a conveyor belt that transports wheat straw to a chest where it is mixed with water and chemicals. The 18,000-square-foot plant is up and running, working toward having its first pulp produced in the next two weeks, said Mike Schock, one of four founders of the company. “We need samples,” Schock said. As many as 25 people at a time will rotate through Pomeroy, training to work at Columbia Pulp’s four-building, 140,000-square-foot Starbuck plant. The Starbuck operation is expected to be ready in December, eventually producing 400 tons of pulp a day, compared with Pomeroy’s 10 tons a day. “This will be a place where we can debug the process,” Schock said of Pomeroy. What happens at Columbia Pulp in the coming weeks and months could have big implications, not just for Pomeroy and surrounding communities, but for the entire paper industry. “This will be the first commercial, non-wood pulp plant in North America,” Schock said. Columbia Pulp will save trees, he said, which provide almost all of the fiber in the United States for disposable products like toilet paper and takeout food boxes. In contrast, the straw that Columbia Pulp consumes has next to no commercial value. At one time, so much of it was burned it was a leading source of man-made particulate air pollution in Washington state. The Washington Department of Ecology took notice, prompting research at the University of Washington. That work resulted in the proprietary blend of Federal Drug Administration-approved chemicals and processes Columbia Pulp uses, Schock said. Straw, which has no nutritional value, is sold as livestock bedding and as a covering for farm-grown mushrooms. “You’re taking waste and turning it into marketable products,” Schock said. What Schock and his partners are doing could jump-start the farm communities of Pomeroy and Dayton, both of which are about 30 minutes from the Starbuck plant. With starting wages in the $20-per-hour range, the new industry’s infusion of well-paying jobs means a lot to the community, said Port of Garfield Manager Diana Ruchert. Once the Starbuck operation is finished, Schock said, its staff will swell to about 110, and staff in Pomeroy will drop to as few as four employees, who will do research and development. “As long as the big plant is going well, I think this place will thrive, too,” Ruchert said of the Pomeroy operation. The company is leasing its Pomeroy space from the port for $6,069 per month, including $752 in taxes. It was once used by Dye Seed Ranch, but had been vacant for more than five years, Ruchert said. Three cranes are on site at the 140-acre Starbuck Columbia Pulp location, where a 75-person construction crew is at work. Six pieces of equipment have arrived at the plant that will be powered by electricity generated by natural gas. There’s a tank where the straw is cooked, a boiler that provides steam for electricity and a press that extracts liquor from the straw so the byproduct can be sold for various purposes. There’s also a refiner that treats cooked pulp, a machine that prepares the pulp for shipping and an evaporator that removes water from the liquor. Columbia Pulp’s impact will extend beyond its plants. Its need for straw is helping farmers, said Dan McKinley, a Dayton area wheat grower. Columbia Straw, an affiliate of Columbia Pulp, is paying on average $65 a ton for straw, depending on a variety of factors. It’s balers, not farmers, who see the majority of that money, but the balers’ work makes raising wheat easier, McKinley. Balers have always removed some straw from fields. But now they’re interested in a greater volume instead of just sticking to the easiest, flattest sections. The more straw the balers take, McKinley said, the less acreage farmers have to burn. That process can take several days for a single field because of air quality restrictions. Getting straw off the fields is important for no-till farming, which is practiced by a number of growers to reduce erosion and improve water retention. Pomeroy and Dayton residents did legwork to help Columbia Pulp get started, and they welcome the changes it is bringing to their communities. Pomeroy officials checked with the Department of Ecology to be sure the city could handle the required 10,000 gallons of water a day, Pomeroy Mayor G. Paul Miller said. The water is released back into the city system after most of the chemicals have been removed. Pomeroy usually gets its water from a spring in the winter months and has backup wells that until now have been used mostly in the summer, Miller said. A typical house uses about 10,000 gallons of water a month. Pomeroy’s water treatment plant has the ability to treat 340,000 gallons of water a day. Business has picked up at Pomeroy’s restaurants, and retailers are seeing more customers walk through their doors since Columbia Pulp arrived, Ruchert said. Some employees training at the Pomeroy location are staying at a recreational vehicle park less than a block away. The brisker pace is welcome after years of watching ventures close, Miller said. Pomeroy lost a Mexican restaurant, a bar, one of two hardware stores, and a plumbing and electrical contractor who handled many repairs in recent years. Columbia Pulp purchased a vacant building in downtown Dayton, said Julie Bickelhaupt, an owner of Blue Mountain Realty in Dayton. “The buildings are filling back up,” Bickelhaupt said. Housing markets in Pomeroy and Dayton are getting stronger too. The average home price in Pomeroy rose slightly in the first seven months of this year to $114,617, compared with $103,345 for the same time last year, according to the Lewis Clark Association of Realtors. “There’s talk of a housing development being built,” Ruchert said. In Dayton, Realtors are sometimes seeing multiple offers on properties, Bickelhaupt said. Not all of that is due to Columbia Pulp, according to Bickelhaupt and Chris Goff, a broker with Coldwell Banker Tomlinson in Lewiston. Homes in Walla Walla are getting so expensive some people from that market are buying in Dayton, Bickelhaupt said. Similarly, Goff said, Pomeroy is getting overflow from the Lewiston-Clarkston Valley. In Pomeroy, Goff said, families can still find homes with three bedrooms and two bathrooms for $150,000 or less. “There’s nothing like that in the valley,” he said. The benefits of Columbia Pulp go beyond preserving forests and diversifying the economies of two of eastern Washington’s small agriculturally dependent towns, Schock said. The process Columbia Pulp uses to make pulp is similar to what the traditional wood products industry has used for decades. Heat, water and chemicals, such as peroxide, isolate the fibers and turn it into pulp. 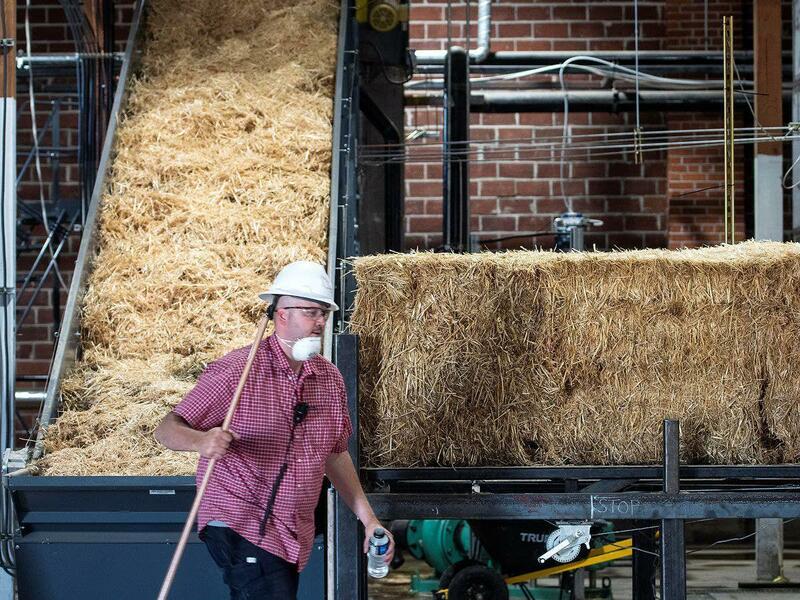 But unlike wood, straw doesn’t have to be pressurized to be turned into pulp, so it consumes less than one-third the energy of making traditional pulp, Schock said. The liquor that’s left over has a number of potential uses. It can be used for dust abatement and de-icing. Some businesses are using a similar mixture to make plastic. The 320,000 gallons of water a day the Starbuck site is expected to consume will come from wells on site, Schock said. It won’t be discharged. It will be re-used, lost to evaporation or leave the plant in products. “This has a much more benign environmental footprint,” he said. Also unlike traditional pulp, Columbia Pulp won’t bleach its product. Schock doesn’t anticipate that will be a problem when marketing it. “(Paper makers) can put a little in there, and it doesn’t affect the brightness of it,” he said. Consumers already are beginning to equate a brown color with green products, and even some fast-food chains have shifted to brown napkins. While Columbia Pulp’s processes are unconventional, Schock anticipates its product will blend well with the traditional industry. Columbia Pulp’s owners don’t expect that new plants will be constructed to turn its pulp into finished products like toilet paper or cardboard. Instead, they expect the pulp to be purchased and blended with traditional wood pulp, partially because it will be so inexpensive. “This is designed to get right into the system and perform as the existing product,” Schock said. Clearwater Paper in Lewiston, one of the closest paper plants to Columbia Pulp, is aware of the business, said Shannon Myers, a spokeswoman for the company. “We do plan to investigate this local, agricultural fiber source to better understand its potential,” Myers said. Published: Aug. 12, 2018, 10:54 a.m.